Dawson Knox, Credit: Nelson Chenault, USA TODAY Sports. The Broncos may have just re-signed Jeff Heuerman, but that doesn’t mean they’re set at tight end. 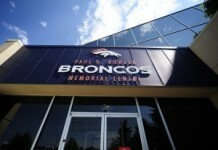 In fact, most expect Denver to draft a tight end, and some are hoping that comes in the first round. A dynamic, play-maker like Noah Fans or T.J. Hockenson would surely do wonders for Joe Flacco, Rich Scangarello and the Broncos offense. However, using the No. 10 pick on a tight end seems like an extremely steep price to pay. Especially if there’s a sure-fire star linebacker available like Devin White or Devin Bush at 10.
if the Broncos go linebacker or quarterback — which both seem more likely than tight end — they could still find a diamond in the rough on Day 2 or even Day 3 in Dawson Knox. Last year, Scangarello and Co. dismantled Denver’s defense with little-known tight end George Kittle. His 210-yard day in the backbreaking win over the Broncos in December was a enough for a new 49ers’ single-game record and a mere five yards short of Shannon Sharpe’s NFL single-game mark. And here’s the kicker about Knox; with his 4.51 40-yard dash at Ole Miss’ Pro Day, now he has nearly the same, exact measurables as Kittle. That includes a 34.5 inch vertical and 16 reps on the bench press. 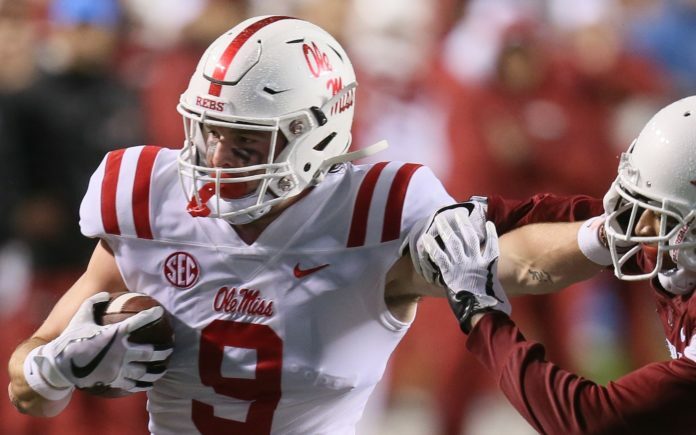 At 6’4″ and 254 pounds, Knox possesses the prototypical build to be a measly tight end at the next level for years to come. If his unofficial 40 from the Pro Day is correct (he was originally clocked at a much-slower 4.73 at the Combine), Knox is an athletic freak of nature, too. What it means is he could possess the perfect combination of blocking size and ability to find open space in passing situations. 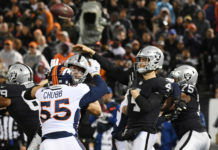 Scangarello, the new Broncos offensive coordinator, could have a field day with Knox, and if everything worked out perfectly, the tight end could be a go-to guy for Flacco on third downs and in the red zone. However, that’s a huge “if” with Knox. Depending on who you look to for draft analysis, he’s anywhere from a first to a fifth-round pick. CBS Sports calls him the 12th-best tight end and the 164th-best player, which would be somewhere in the fifth round. Jon Ledyard predicts he’ll land with an NFL team in the third round, highlighting his improvement in blocking this year but his lack of targets in the red zone or with 50-50 balls. He also notes Knox’s lack of creativity when in the open field and so-so pass-blocking skills. And here’s the thing with Knox; no one really knows what to expect because not only did he leave school a year early, his numbers are shockingly low. His sophomore season in 2017 was his best, with 24 receptions for 321 yards. Last year, the underutilized tight end caught a mere 15 passes for 284 yards, which is a superb 18.9 yards per catch average. But, he had zero touchdowns in his collegiate career — none — and only one target in the red zone as a senior. Knox has a lot of the tangibles in terms of a massive build, great speed, big hands and an ability to leap high; but can he go up and steal a pass from a defender? How good is his pass-blocking? Can he make an NFL defender miss in the open field? Because his career was so short and so unproductive, spending higher than a fourth-round pick on Knox would be a massive gamble. But, the hype train is leaving the station and it may take a third or even second-round pick to steal this diamond in the rough. For the Broncos, taking Devin White at No. 10, Dalton Risner at No. 41 and then Knox at 71 would be addressing the team’s three biggest needs while also basically knocking those first two picks out of the park. White and Risner would give John Elway and the front office a little wiggle room to gamble in the third on the raw, unknown quantity in Knox. 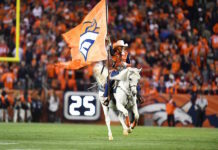 Don’t forget, Elway has gambled in basically every third round of every draft he’s been in charge of with the Broncos, and to add even more smoke to the fire, Denver is reportedly very interested in Knox. Of course, so are multiple other teams.